The success of our clients has always been our priority. This drives us every day to make sure that their platforms work. 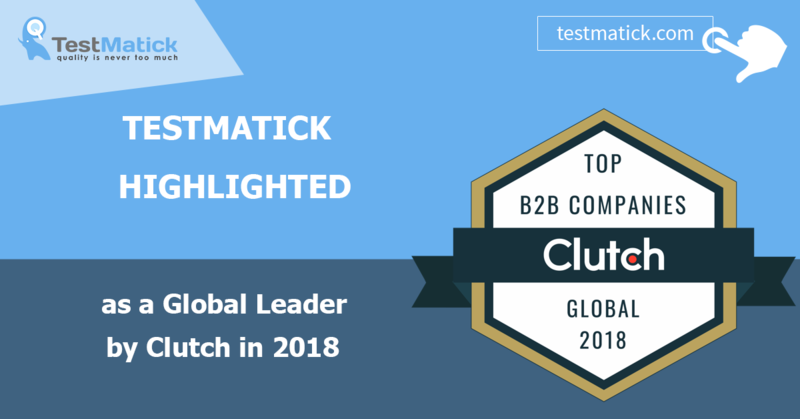 At Testmatick we are proud have earned a spot among the top B2B companies in 2018 by helping our clients around the world accelerate software delivery by offering industry leading techniques including automated testing to create excellent experiences. Quality Assurance is vital but can often fly under the radar. Not for Clutch. Clutch is a ratings and reviews platform that connects small and medium-sized businesses with the developer, agency or software testing companies that best fits their needs. Clutch doesn’t just publish short testimonials from clients. They facilitate B2B transactions by verifying the companies on their site and sister page The Manifest by conducting in-depth interviews with clients. At Testmatick we can appreciate the attention to detail in their rankings which is why we take this recognition so seriously. Special thanks to our clients who took the time to share their kind comments. We also want to thank Clutch and The Manifest for including us in their research. We’re looking forward to a continued relationship in 2019 and working hard for more great reviews soon.